Police Report: 5 people were killed after a bus fell into a gorge in the district of Palghar, Maharashtra. The police added that 45 people were also injured in the accident. 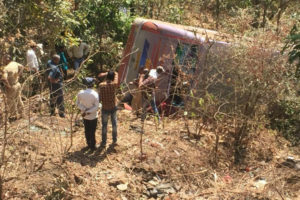 Chief Santosh Kadam of the RDMC said that the accident happened on Sunday afternoon in Torangane Ghat near the villages of Trimbakeshwar and Mokhada. Chief Santosh added that the privately owned bus was coming from Nashi and was going to Palghar. 45 people were rushed to the Trimbakeshwar Primary Health Centre, some of the injured people are currently in critical condition.